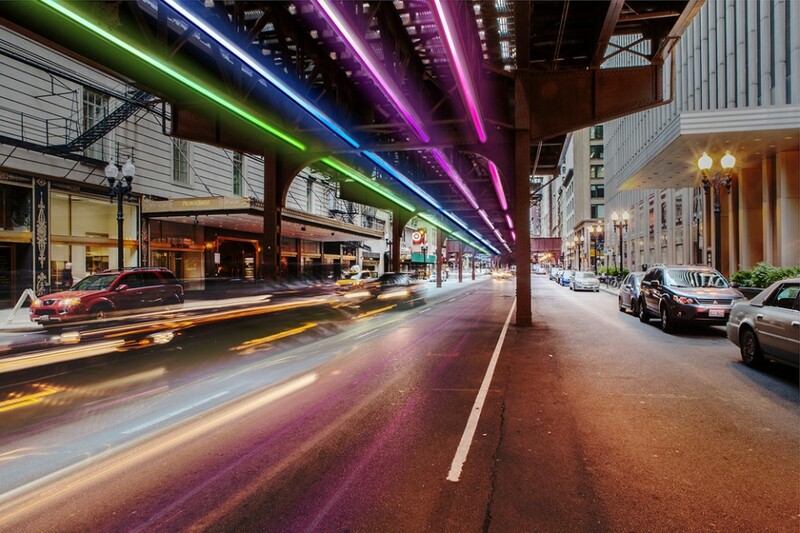 Designed to be suspended below Chicago’s elevated rail system, hovering above cars and pedestrians, this 5,000-tube neon lighting installation aims to bring bright colors to drab railway tracks, using illumination to bridge the dark gap formed by overhead infrastructure. 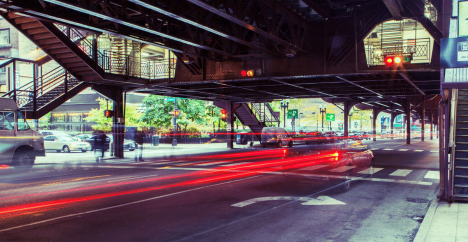 A set of elevated rails forming a rounded rectangle in the heart of the city, the Chicago Loop defines the downtown experience. Physically, visually and audibly, this nexus of sometimes-subway lines creates a circuit of transit over and under which vast numbers of people travel each and every day. 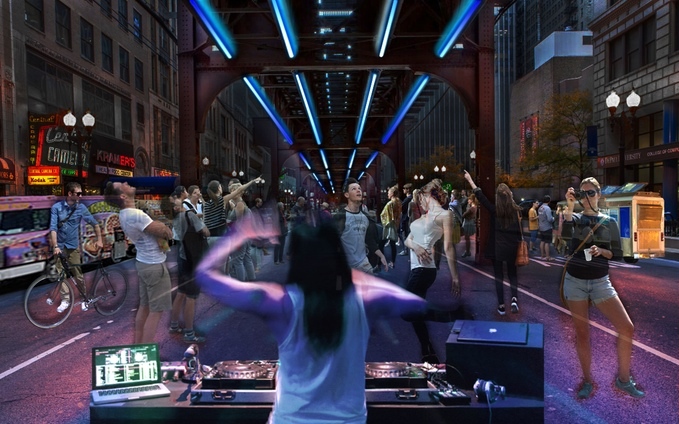 Despite its centrality and functionality, the Loop has little presence in terms of the city’s public image, at least it until The Wabash Lights came along. The main aim is to activate this shady pseudo-circular zone, turning it from an ignored void into a enjoyed space. The first phase of the project has already been successfully funded on Kickstarter and the next step will be a limited-scale test implementation of the technology. 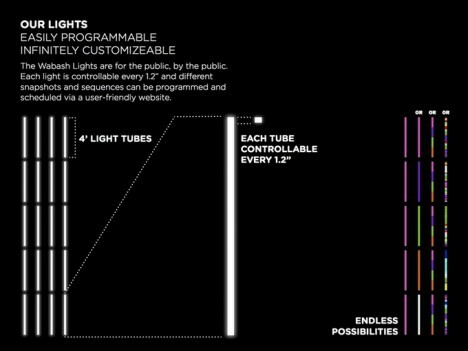 The lights are highly programmable and infinitely customizable, able to cycle through sets of colors and form complex patterns. 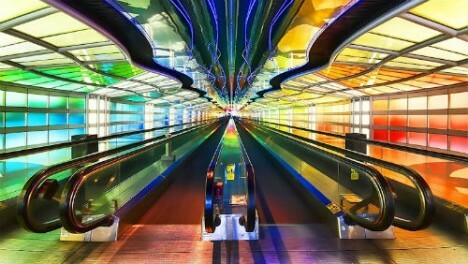 The duo behind the idea, Seth Unger and Jack C. Newell, are well-suited to the endeavor, with backgrounds in design, branding and creative strategy on the one hand, filmmaking and public art on the other. Together, they are looking to involve citizens from start to finish, looking to them for feedback as well as funding. 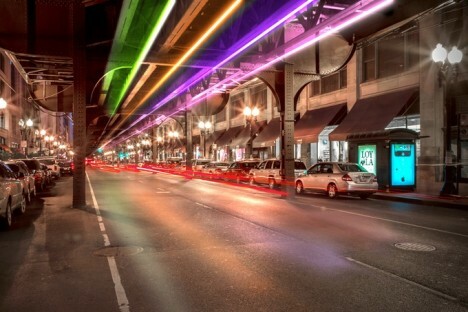 More on the project from its creators, using “LED light tubes to transform an iconic piece of Chicago infrastructure into a canvas for a dynamic, interactive experience, serving as a catalyst for a re-energized Wabash Avenue. Working with the Chicago Transit Authority, Chicago Department of Transportation, and City Government, we have received approval to install a small section of lights on the Wabash Ave tracks to troubleshoot design, interactivity, and test how vibration from the “L”, temperature changes, and the wear and tear of the city affect our hardware.” (Hat tip to Chris B and James B).